Whether you opt for a one or two-bedroom North Myrtle Beach condominium at Tilghman Shores vacation property in North Myrtle Beach, South Carolina, you will be comfortable in accommodations that are beautifully appealing, quaintly furnished and conveniently equipped. Natural sunlight streams into these North Myrtle Beach condominiums. Enjoy a dining area where your family can eat some meals together that you prepared yourself in your own full kitchen. Lounge about the living room or take your family conversation outside to the balcony where you can also watch the beautiful moon rise. This lakefront North Myrtle Beach resort is centered around a sparkling blue swimming pool. Just bring your beach towel, a good book and grab a chaise lounge. 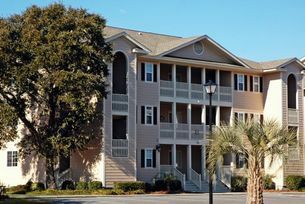 These condominiums in North Myrtle Beach, SC feature a washing machine, clothes dryer and a dishwasher. Some of these North Myrtle Beach rentals have high-speed Internet access and DVD players, too. These North Myrtle Beach condominiums accommodate from four to eight people comfortably. The beachfront is just a few blocks away from Tilghman Shores. Piers filled with fishermen dot the North Myrtle Beach area waters and recreational boats and Sea Doos ride the waves just offshore. With nearby oceanfront views, terrific North Myrtle Beach vacation resort amenities and comfortable furnishings, everything you need to enjoy a fabulous North Myrtle Beach vacation is right at your fingertips. The best sights and sounds North Myrtle Beach, South Carolina offers are just around the corner from Tilghman Shores. Before conquering a championship golf course, hit some golf balls at the driving range. Grab a bite to eat at one of your favorite North Myrtle Beach seafood restaurants and be tempted by the fresh catch of the day. From racing cars to riding a roller coaster, there is much to see and do in Myrtle Beach, South Carolina during your next family North Myrtle Beach vacation. Elliott Beach Rentals is not affiliated with onsite management or the HOA of Tilghman Shores.